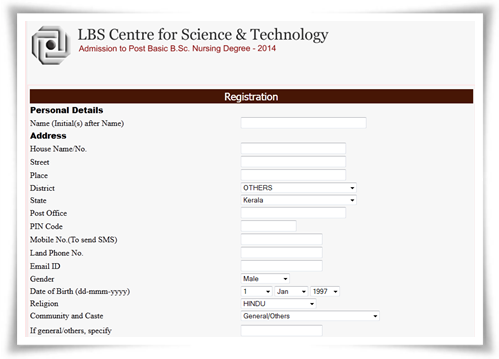 LBS Centre for Science and Technology, on behalf of Kerala Government has invited applications from eligible candidates for admission to the post basic BSc nursing degree courses in Kerala during the upcoming academic year. The duration of the course will be 2 years while the admission is regulated on the basis of merit as assessed in the rank lists which will be prepared based on the marks obtained by the candidates in the Entrance Examination. According to revised schedule the last date for online application has been extended to 26th June and the entrance test fixed to be conducted on 6th July 2014. It is very important to note that the candidates should have attained the academic eligibility on or before the last date (26th June 2014) specified for submission of the application. The applications can be submitted only through online process which is open through the official website www.lbscentre.in. After paying the concerned fee at a scheduled bank, the details in the chalan form should be entered. The sole registration ID and password should be kept strictly confidential while the copy of the printout must also be retained for future reference. The selection and preparation of rank list for Post Basic B.Sc. Nursing course 2014 would be made on the basis of performance in the entrance examination. The exam will be held at Thiruvananthapuram, Ernakulam and Kozhikode. During the time of online registration, applicants have to can choose one centre. The admit cards for the entrance exam can be downloaded from the website. The exam will have one paper of 90 minutes duration and shall be of the standard of GNM examination. After the preparation of the rank list, a trial allotment will be conducted to which will be followed by a couple of more allotments. Candidates should have to keep constant touch with the official website www.lbscentre.in and also the leading print and electronic media to know about the updates of notification regarding the allotments.